Sport plays an important role in our societies. The diverse educational practices of sport, can be efficient to convey values of solidarity, diversity, inclusiveness and cultural awareness. It has a specific place in our societies combining a healthy physical activity with social and cultural heritage and diversity. Sport can be a very powerful tool for education and inclusion when working with young people because it can be very motivating and interesting. It can create a bridge between different social groups and better mutual comprehension and dialogue. The use of the martial arts explores various new possibilities of Sport as a tool for education and inclusion. In the Bulgaria as well as in other Balkan countries, persons with disabilities and those from other disadvantaged groups are generally excluded from education, employment and community life from a young age. Exclusion deprives them of opportunities to engage and develop relationships with others —opportunities essential to their social development and important determinants of health and well-being. The martial arts as concrete sport activity are well suited to helping disadvantaged young people to acquire social skills they may be lacking. It teaches them how to communicate effectively as well as the significance of teamwork and cooperation, goal-setting, self-discipline, respect for others, and the importance of rules. 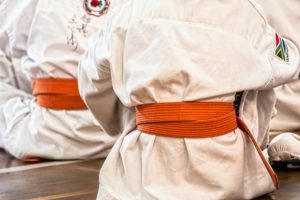 Martial arts also enable disadvantaged students to take risks and learn how to manage failure and success in a safe and supportive environment. Coaches and teammates provide important role models and can help young people to develop skills they can apply in other aspects of their lives, such as employment. The benefits of physical activity are universal for all children, including those with disabilities. The participation of disadvantaged students in sports and recreational activities promotes inclusion, minimizes deconditioning, optimizes physical functioning, and enhances overall well-being. The project has as main objective to train sports teachers in schools in remote/rural areas as well as those that have a lot of socially disadvantaged pupils to introduce Martial Arts to stimulate the inclusion of socially disadvantaged youth, regardless of age, race, gender or ability, and have Martial Arts become a lever to strengthen self confidence, control violence and strengthen community aspects. There is no reason why Martial Arts can’t be practiced by everyone with, if necessary, the right adaptation to the individual. The project is proposing a range of innovative techniques to stimulate and facilitate the uptake of inclusive martial arts sport trainings, using a mobile and online training and community platform.